Ever since Metá Metá were formed in 2008, they’ve been at the centre of Sao Paulo’s new, vibrant and exciting music scene. It finds artists constantly collaborating on a variety of new and different projects. This includes the three members of Metá Metá. When Jucara Marcal, Thiago Franca and Kiko Dinucci are neither recording nor touring with Metá Metá, they’re often to be found collaborating with other musicians on new albums and projects. Then when the time came for the members of Metá Metá to record their solo albums, the musicians they had collaborated with, were more than happy to return the favour. It was a similar story when the time came for Metá Metá to record their third album MM3, which was recently released on the Jazz Village label. Joining vocalist Jucara Marcal, guitarists Kiko Dinucci and saxophonist Thiago Franca for the recording of MM3, were a few of Metá Metá’s musical friends. This included Siba and Rodrigo Campos who cowrote a trio of tracks. However, when it came to recording MM3, Metá Metá were joined by drummer Sergio Machado and bassist and producer Marcelo Cabral. They’re both active participants in the Sao Paulo music scene. So have Metá Metá, since they were formed back in 2008. That was when Jucara Marcal, Kiko Dinucci and Thiago Franca made the decision to form a group together in Sao Paulo. It’s the biggest city in Brazil, and has a thriving and eclectic music scene. The three members of Metá Metá were all experienced musicians. This includes the multitalented Kiko Dinucci. He was born in Sao Paulo, and is a composer, guitarist and visual artist. Kiko Dinucci released his debut solo album Na Boca Dos Outros in 2009, the year after he founded Metá Metá. Two years later, Kiko Dinucci’s other group Passo Torto released their debut album. Passo Torto released their debut album Passo Torto in 2011. Since then, Passo Torto has released Passo Elétrico in 2013, and in 2015, a collaboration with Ná Ozzetti, Thiago Fraça. This is just part of Kiko Dinucci’s recording career. In total, Kiko Dinucci has released around fifteen albums. They range from samba and free jazz, right through to noise. He has also worked with some high profile Brazilian artists, including Elza Soares and Tom ZÈ. Kiko Dinucci has also collaborated with many of the leading lights of Sao Paulo independent music scene, including Criolo, Lucas Santtanna, Ava Rocha and Ogi. Despite such an impressive musical CV, music is only part of Kiko Dinucci’s life. He designs artwork and album covers, including for Meta Meta, Passo Torto, Sambanzo and Charanga do Franca. Then there’s also Kiko Dinucci’s career as a filmmaker. So far, he has two films to his name, Danca das Cabacas and the fictional documentary Breve em Nenhum Cinema. The Metá Metá guitarist it seems, has many talents. Equally talented are the other band members. Thiago Franca was born in Belo Horizonte, in 1980. Thirty-six years later he somewhat modestly describes himself as a musician, composer, arranger and producer. That is something of an understatement. Malagueta, Perus E Bacanaço was released in 2014, with Space Charanga: R.A.N. following in August 2015. By then, Thiago Franca was dividing his time between Metá Metá, his solo career and countless other projects. This included the groups and projects he was involved with. Among the other groups Thiago Franca has founded, are Sambanzo and MarginalS. These groups play and sometimes, combine disparate musical genres and influences. This includes Afrobeat, Ethiopian jazz, free jazz, noise and traditional Brazilian music. So is the music Thiago Franca has recorded, produced and collaborated on. When Thiago Franca isn’t working with Metá Metá, on solo albums or with the other groups he has founded, he can be found working with other artists. This is part of the ethos of the Sao Paulo’s new music scene, artists constantly collaborating. Thiago Franca is no different, and records and produces other groups. Sometimes he even plays live with them. Among the artists Thiago Franca was worked with are Criolo, Emicida, Rodrigo Campos, Lucas Santtanna, CÈu,Otto and Tulipa Ruiz. Thiago Franca has also featured on Dinucci¥s and JuÁara¥s solo albums. It seems that Thiago Franca is just as hard working as Kiko Dinucci. So is the third member of Metá Metá, is Jucara Marcal. She is Metá Metá’s lead singer, and is a member of Vesper and A Barca. This keeps Jucara Marcal busy. Still, though, she found time to release her debut solo album Encarnado in 2014. It featured songs by Kiko Dinucci and Rodrigo Campos. These songs were part of an award winning album. Encarnado went on to win the APCA award and the Governor of Sao Paulo’s award for the best album of 2014. Buoyed by the success of Encarnado, Jucara Marcal collaborated with experimental musician Cadu Tenorio on the album Anganga. It was released in 2015, and introduced her music to a new audience. However, this was just Jucara Marcal’s latest collaboration. Previously, Jucara Marcal has worked with Rodrigo Campos, Luiz Tatit, Ava Rocha, Gui Amabis, Ogi and Criolo. Nowadays though, much of Jucara Marcal’s time is spent working with Metá Metá, which is the mothership that the three members seem to gravitate back to. Metá Metá was founded in 2008, and since then, has released two Eps and a trio of albums. Each album is different from its predecessor, as Metá Metá take a new approach to Brazilian music. They draw inspiration from different musical genres and influences, including jazz, rock and African music. Especially candomblé, which is the music of the yoruba, fon and bantu groups. This is combined with Brazilian music, and results in music that’s innovative, exciting, and devoid of musical and cultural cliches. That has been the case since Metá Metá’s debut album. Three years after Metá Metá were formed, the released their eponymous debut album in 2011. The album showcased a minimalist sound. It was a case of less is more on Metá Metá, where the trio fused polyphony and silence. This proved an effective combination, and one that caught the imagination of discerning record buyers. However, it was Metá Metá’s sophomore album Metal Metal, that introduced their music to a wider audience. When Metal Metal was released in 2012, gone was the minimalist sound of Metá Metá. It was replaced by a genre-melting, multilayered sound. Elements of African, Brazilian and Latin music were combined with avant-garde, free jazz and even punk. The result was an album that was released to widespread critical acclaim. Suddenly, Metá Metá’s music was finding an audience much further afield than their native Brazil. Music fans in America, Britain and Europe were won over by Metá Metá. They soon became festival favourites, as they toured the world showcasing their unique, genre-melting sound. Before long, Metá Metá were popular at home and abroad. That popularity will doubtless continue to grown when Metá Metá released their long-awaited and much anticipated third album MM3. With time in their respective schedules, the three members of Metá Metá began work upon their third album MM3. Together, they wrote three songs, Angoulême, Angolana and Corpo vão. Meanwhile, Metá Metá guitarist Kiko Dinucco had written Osanyin; and cowrote Mano Légua with vocalist Jucara Marcal. The band had also decided to cover the traditional song Obá Kosô. It would be given a makeover by Metá Metá and would close MM3. Elsewhere, songwriting partnerships were blossoming. Especially, between members of Metá Metá and their musical friends. This was how the Sao Paulo music scene worked. Kiko Dinucco wrote Toque Certeiro with Siba. Thiago Franca wrote Três Amigos with Sergio Machado and Rodrigo Campos. He wrote Imagem do Amor with Kiko Dinucco. Gradually, the songs that became MM3 took shape. When they were finished, they were recorded by Metá Metá with a little help from their friends. As the recording began, vocalist Jucara Marcal, guitarist Kiko Dinucci and saxophonist Thiago Franca were joined by two of Metá Metá’s musical friends. This included drummer Sergio Machado and bassist Marcelo Cabral. 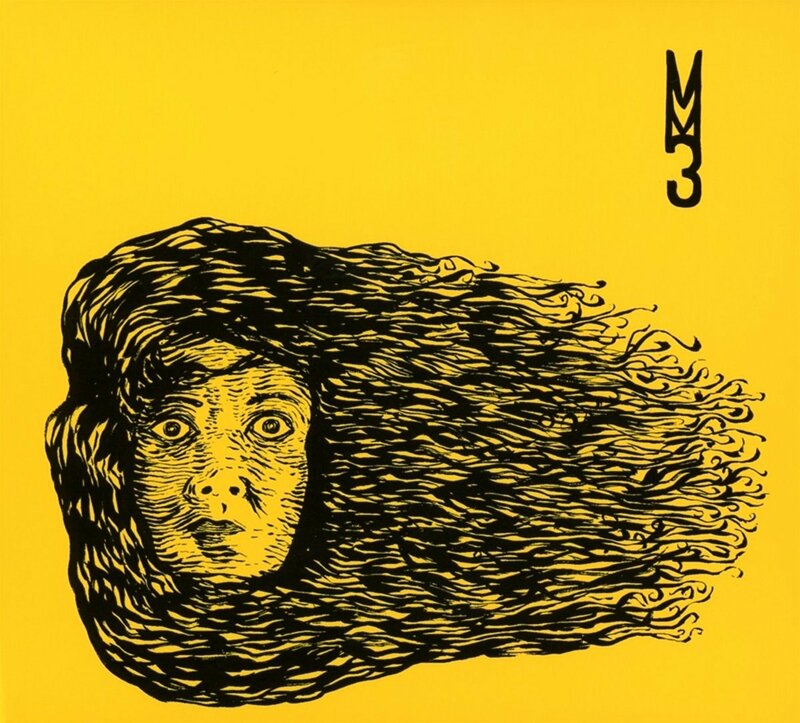 They slotted into the rhythm section beside guitarist Kiko Dinucci, and gradually, Metá Metá’s most eclectic album to date, MM3 took shape over the course of just two days. MM3 found MM3 Metá Metá combining disparate musical genres and influences. This included African music, and specifically, music from, Ethiopia, and Mali, Morocco and Niger MM3. It was combined with avant-garde, jazz and rock. Metá Metá also improvised as they recorded MM3, and this took the music in unexpected directions. Another feature of MM3 was the use of minor scales and harmonies. They feature on MM3, where Metá Metá try to replicate their live sound on MM3. It’s also an album that reflects Brazil in 2016. Opening MM3 is Três Amigos. Just a bass combines with the pitter patter of drums and a sultry saxophone. A guitar chimes, as a moody, jazz-tinged cinematic backdrop unfolds. Soon, though, it’s all change and the smouldering backdrop is joined by Jucara Marcal’s vocal. It’s a mixture of power and passion, while searing guitars cut through the arrangement where rock and jazz combine. By then, Metá Metá are improvising, as the braying free jazz saxophone competes with the rhythm section, blistering guitar and a defiant, impassioned vocal. After four minutes, this potent and heady brew reaches a crescendo, and has whetted the appetite for the rest of what could well be a veritable musical feast. A lone growling saxophone soars high above the arrangement to Angoulême. Before long, the arrangement explodes, as musical genres combine. Elements of avant-garde, punk, rock and free jazz combine with Latin. The punk inspired vocal is joined by a rhythm section that charges across the arrangement. Drums pound, while the saxophone references avant-garde and free jazz. A myriad of whirring, grinding sounds punctuate the arrangement. They remain when the vocal drops out, and combine with the free jazz saxophone. That’s until the urgent, emotive vocal returns as Metá Metá continue combine the spirit of ’76 with avant-garde, free jazz and indie rock. In doing so, Metá Metá showcase their versatility and inventiveness. Just a probing guitar is played as Imagem Do Amor slowly begins to reveal its secrets. It’s join by a rasping saxophone and a tender vocal. Soon, it’s a mixture of power, passion and defiance, as the rest of Metá Metá kick loose. They create a rocky backdrop, before quivering saxophone signals a change. The tempo drops and Metá Metá return to the earlier understated sound. Not for long, as they soon kick out the jams as a blistering rocky track briefly unfolds. However, Metá Metá are chameleons, and return to a jazz-tinged sound and even balladry, before combining a raucous fission of punk, free jazz and rock. They might seem like strange bedfellows, but work, and work well. Straight away, Metá Metá kick loose, and embark upon a magical musical mystery tour on Mano Légua. Early on, they incorporate elements of jazz, rock and folk. Again, Metá Metá combine power and volume as they play at breakneck speed. Soon, though, they drop the tempo, and a braying, rasping saxophone joins the chiming guitar. The vocal veers between tender and thoughtful, to a fusion of power and passion. 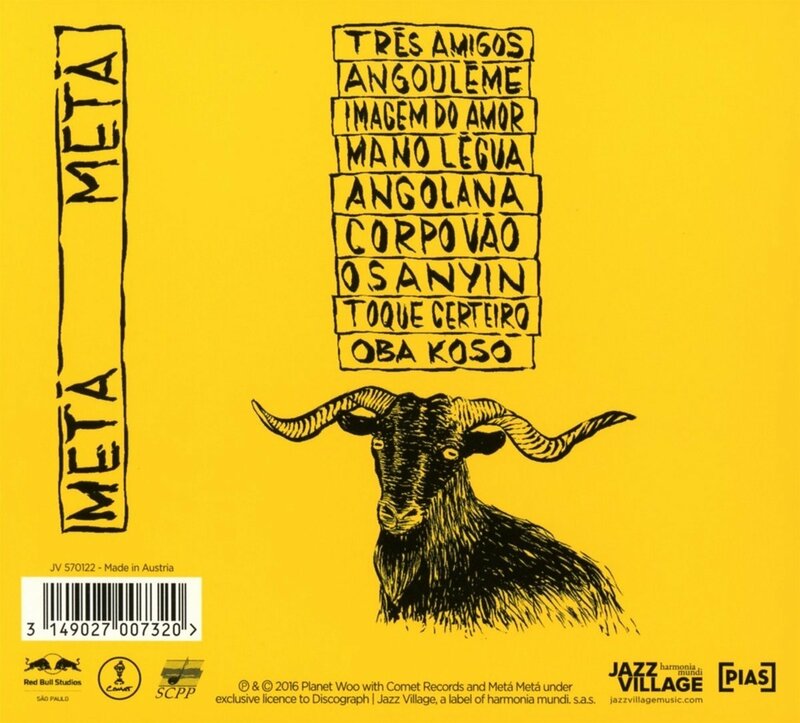 Metá Metá take their lead from the vocal, and when the tempo drops, saxophonist Thiago Franca improvises, and heads in the direction of free jazz. This allows them to showcase their skills. Mostly, Metá Metá play with power, passion and urgency, as if desperate to get their message across on another glorious genre-melting track. Scampering percussion and drums combines with the bass and chiming guitar on Angolana. A subtle, sultry saxophone proves the perfect accompaniment to what’s one of Jucara Marcal’s best vocals. She sings within herself, eschewing power for tenderness and emotion. The rest of the band take care not to overpower the heartfelt vocal. This results in a beautiful and cinematic track where folk, jazz, Latin and rock combine seamlessly to create one of MM3’s highlights. As Osanyin unfolds, the arrangement is almost understated. Just the guitar, percussion and rhythm section combine with a braying saxophone. Elements of blues and rock combine, while Jucara Marcal’s vocal is tender and sometimes, jazz-tinged. So is the saxophone. It heads in the direction of free jazz, groaning, growling and rasping. Meanwhile, Metá Metá improvise, while Jucara Marcal’s vocal is heartfelt and soulful. Again, she eschews power and sings within herself, while the saxophone is played with power. Especially as Metá Metá improvise, before Jucara Marcal’s vocal returns. All the time, the rhythm section drive the arrangement along, as machine gun licks are unleashed on the guitar. They play their part in what’s a captivating combination of free jazz, rock and jazz. Straight away, there’s an African influence to Toque Certeiro. This comes courtesy of the rhythm section and chiming, crystalline guitar. Meanwhile, Jucara Marcal scats, before delivers a joyous vocal. Later, bursts of braying saxophone punctuate the arrangement, before growing in power. When the saxophone drops out, Jucara Marcal’s vocal takes centre-stage. It’s soulful and joyous, as the rhythm power the arrangement along. They’re joined by a chiming guitar and the growling guitar. Together, they create a fitting homage to Metá Metá’s love of African music. Obá Kosô which closes MM3, has a jazz-tinged cinematic sound. The arrangement meanders along African drums and a firmly strummed guitar providing the backdrop to the sultry saxophone. Soon, a bass adds a dark, moody sound, as it prowls along. Late r, a rocky guitar shimmers, and joins the rasping, braying guitar. By now, Metá Metá are enjoying the opportunity to jam, and showcase their musical prowess. Just when it seems things can’t get any better, a soulful, spiritual vocal is added. Harmonies augment the vocal, adding the perfect foil to the vocal. As Metá Metá fuse elements of rock, jazz, soul, Afrobeat and avant-garde, they’ve never sounded better. The Três Amigos have kept the best until last, as they come of age musically. Although Metá Metá have been together since 2008, and have released two previous albums, MM3 is the best album of their career. Metá Metá and their musical friends have created what is without doubt, the best and most eclectic album of their career. They combine everything from Afrobeat and avant-garde, to folk, free jazz and funk through to jazz, Latin and rock. Seamlessly, Metá Metá switch between musical genres, and sometimes, even combine several different genres on the one track. The result is MM3, a potent and heady brew from one of the leading light’s of Sao Paulo’s new, vibrant and exciting music scene, Metá Metá. That is no surprise, as Metá Metá feature three truly talented and versatile musicians. They’ve spent the last eight years making music together, and nowadays, are popular throughout America, Britain, Europe and South America. However, MM3 which was recently on the Jazz Village label is the album which should introduce Metá Metá to a new and wider audience. No wonder. MM3 is a career defining album from Metá Metá. They come of age musically on MM3, an album of genre-melting music with an important social message. It finds the Três Amigos, Metá Metá reach new and untold musical heights on their latest and greatest album, MM3. ← LITTLE RICHARD-THE RILL THING, THE KING OF ROCK ’N’ ROLL AND THE SECOND COMING.